Extremely Rare- Arizona Sleeping Beauty Turquoise (Ovl 18X13), Natural White Cambodian Zircon Cluster Ring in Platinum Overlay Sterling Silver 10.500 Ct, Silver wt 8.73 Gms, Number of Gemstones -157. Arizona Sleeping Beauty Turquoise (Ovl 7.00 Ct), White Topaz Ring in Platinum Overlay Sterling Silver 8.750 Ct.
AA Arizona Sleeping Beauty Turquoise (Ovl 4.15 Ct), Malgache Neon Apatite and Boi Ploi Black Spinel Ring in Black Rhodium and Platinum Overlay Sterling Silver 5.750 Ct. Silver wt 6.80 Gms. Arizona Sleeping Beauty Turquoise (Rnd), Natural White Cambodian Zircon Ring in Rhodium Overlay Sterling Silver 2.750 Ct.
Arizona Sleeping Beauty Turquoise (Rnd), Malgache Neon Apatite Ring in Yellow Gold Overlay Sterling Silver 3.250 Ct. Silver wt 5.23 Gms. SLEEPING BEAUTY TURQUOISE (4.65 Ct) 9K Y Gold Ring 4.650 Ct.
SLEEPING BEAUTY TURQUOISE (1.95 Ct) and Diamond 9K Y Gold Ring 2.000 Ct.
Flaunt the thrill of the open skies with the soft blue hues of turquoise. Slip on a dainty or a bold turquoise ring to don the poise of understated elegance. In our collection, you’ll find a marvellous range featuring designs and lays that’ll leave you wanting for more. With clever renditions and swoon-worthy additions, our rings will add to the basic delights and deliver joy! At TJC, you’ll find a fulfilling and stunning collection of precious and genuine turquoise rings. With new and novel designs, this range promises exquisiteness you’d never have seen anywhere else. The stunning and clear colour of the cabochons makes for a cheerful charm element. Seeing the range of different turquoise found in our selection, you’ll have no ring that looks like other. We take immense pride in our variety. Streaked with golden, white, or brown hues, the stones have an effervescent allure that’s unmatched. Take a peek at the lush and sublime range in a number of other designs. One of the biggest collections that we boast of brings you rings that have been studded with the popular and loved variety of the gem – Sleeping Beauty Turquoise. Mined from Arizona, this type of the gem has been loved and coveted by countless. The pale blue hues of it represent open skies and endless opportunities, a reason why it is so famed. Our large turquoise rings in the collection bring fantastic displays of the gem, so don’t miss them out. There’s nothing more brilliant than pairing the quaint and open-sky hues of this gem with the traditional radiance of gold. 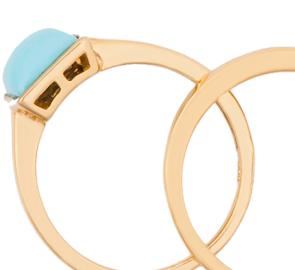 Our classic pieces of gold and turquoise rings have made rounds of fame for their unique style and heart-winning designs. We offer you not only the classic and traditional appeal of yellow gold, but also the posh and elite luxury of white gold along with darling exquisiteness of rose gold. The charming spells of silver blend perfectly with the gorgeous and cheery hue of turquoise. Our range of sterling silver turquoise stone rings offer you immaculate luxury that will stay the same for a long time to come. Our designs of these rings come in a celebrated and fantastic array that will make you shop for more. For a more luxurious look, we also offer you designs that have been plated with premium metals, like platinum, gold (yellow, white, rose gold,) rhodium, and others as such. No more do you need engagement rings that sparkle with the spells of a diamond. The era has changed, and colours are ruling. There’s no better hue for eternity as the luxury of a turquoise. Our designs of turquoise engagement rings in UK have stolen countless hearts! The Birthstone of December will also be the perfect option for women born in the month. Present your fiancé with a design that she’ll love and explore our fantastically wide display. The calming and serene colour of turquoise looks absolutely perfect in contrast with the fiery sparkle of diamonds. Our marvellously designed diamond and turquoise rings in UK have taken the fashion world by storm. These stunning keepsakes have made their place in the hearts of countless. Available in different sizes and styles, they are curated to be keepsakes. Come and find your favourite among the bests. TJC brings you a promise of the best real turquoise rings online in UK. Find the epitome of luxury and charm combined with the best designs with us. We offer and promise stunning rings moulded into novel cuts and new designs, all brought together for a sublime array of selection. Other than that, you’ll also find that our pricing of affordable turquoise rings online is far more reasonable. We source our gemstones straight from the mines with a two-fold purpose: we get the genuine and high-class guarantee and we eliminate the need of middle-men. That ensures that we can offer you the authentic diversity at pocket-friendly prices.